Post malone ’s Beerbongs & Bentleys sophomore outing has spent it’s fifth week at the No. 1 spot on Billboard’s Top R&B/Hip-Hop Albums chart, becoming the first album since 2014 to spend at least five weeks at the top. The last person to hold the title was Beyoncé with 2013’s internet-breaking self-titled LP, spending eight weeks at No. 1 from December 2013 to February 2014.
becomes the first male artist to spend five weeks at No. 1 since Eminem’s The Eminem Show spent its first five frames 15 years ago in 2002. That September it would grab the No. 1 slot once again. Beerbongs can attribute much of its success to the onset of streaming in 2018, breaking the one-week streaming record in the United States within its first seven days after it garnered 431.3 million on-demand audio streams. R&B/Hip-Hop Songs chart; including No. 1 single “Rockstar” which occupied the penthouse for 14 weeks. Right now, the Ty Dolla $ign – assisted “Psycho” is at No. 2 both on the Hot R&B/Hip-Hop Songs Chart and the coveted Billboard Hot 100. Within the last 14 weeks, Psycho has not left the top five on either chart. 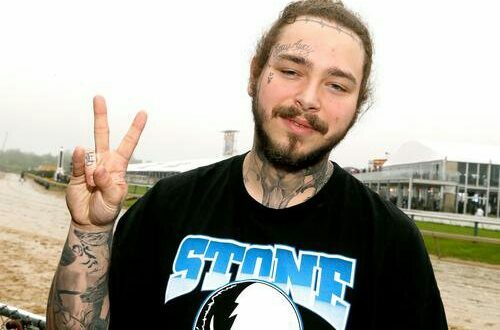 At the moment, Post Malone’s debut Stoney album is sitting at No. 8 on the Top R&B/Hip-Hop Albums charts, tallying up 70 weeks in the top ten as it slowly creeps up on the record of 76 weeks currently held by Michael Jackson’s Thriller. 0 Response to "Post Malone’s Sophomore Album Beerbongs & Bentleys Breaks Another Record"